In the last post Ollie wrote a story. This is a brief note about what we did next - a puppet show. 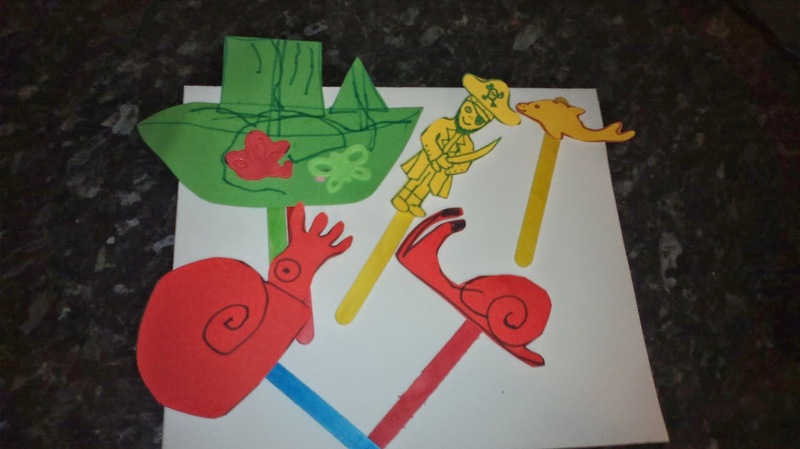 Ollie and I drew characters from Ollie's story and Toby helped us by decorating the pirate ship and sticking on the lolly sticks (using double sided tape). We then set up a stage using a table cloth and two chairs and Ollie performed the story with help from Toby as I read it out. 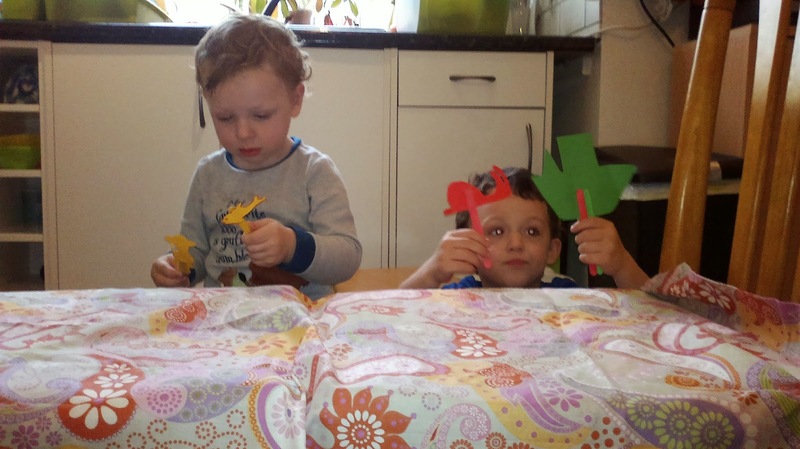 Next the boys brought in their drums and keyboard and performed a musical interlude before returning with extra puppets made at play group (lions, insects and a flamingo) and adding to the narrative. Finally all the chairs were pulled out and covered in table cloths and blankets to form a tunnel between a pirate ship (a table) and a desert island (another table). The boys spent half and hour chasing each other around under the furniture before sharing a picnic in a secret cave (under the dining table). The boys seem to really like it when we follow a theme in play. Some days we might read a book together and then carry that into our play, making props and imagining the rooms of the house as different places in the story. By acting out favourite parts of a story and making drawings and toys based on it you are helping your child's comprehension of the book. This helps children to connect enjoyable play experiences with reading and primes them to want to read for themselves because they already see that books can take them to imaginary worlds and exciting adventures. The questions you ask and the comments you make can help to stretch their acquisition of everything from verbal descriptive skills to empathy 'In the book the pirate was eaten by the whale, where is he now? How do you think he feels being stuck in the whale's tummy? Blue whales normally eat little tiny sea creatures called krill? Do you think the whale has a sore tummy after eating the pirate instead?'... This is a good opportunity to really listen to their thought processes too and validate their opinions and imagination. Reading at bedtime is a lovely routine and it's a gift to able to spend that precious bit of time snuggled up reading to drowsy little ones, but it's also great for kids and parents to take reading out of the bedtime and into the light of day for a different experience of books.